Sarsfields Juvenile Hurling Club is a vibrant hurling club catering for 340 boys from the ages of 5 to 16 years. We provide regular coaching sessions, fun games, blitzes, competitive competitions, summer school, outings, trips and many enjoyable activities in a safe environment with an emphasis on participation and physical activity. To succeed in all this we need funds and financial support to cover the on-going costs of running the juvenile club. We do not charge a regular subscription for attending training, matches or referee fees. But each year we spent thousands on hurleys, sliotars and equipment and this year we also did some running repairing and clean up of the facility following the Winter storms. As we reach the end of another juvenile hurling year it is that time were we start to prepare for the next 12 months. It starts with our Annual Table quiz which is our main fundraiser for the Juvenile Club. 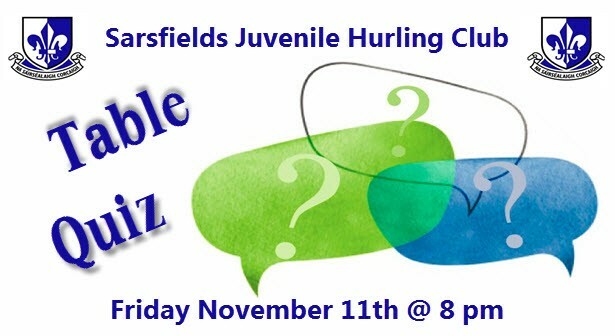 The Table quiz will be held in our Pavilion on Friday 11th November and it is a great social events and a bit of fun giving you the chance to support the Juvenile Club and ensure the future is bright for all the kids in the community. Therefore please lend you support by attending on the night or you can also sponsor a table or seat by Clicking Here and making a contribution.